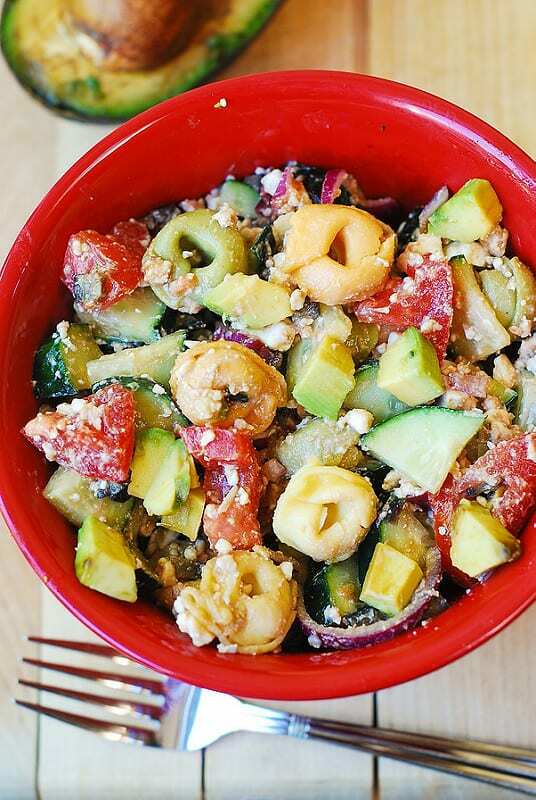 Greek tortellini salad with tomatoes, avocados, cucumbers, feta cheese – in homemade Greek salad dressing. 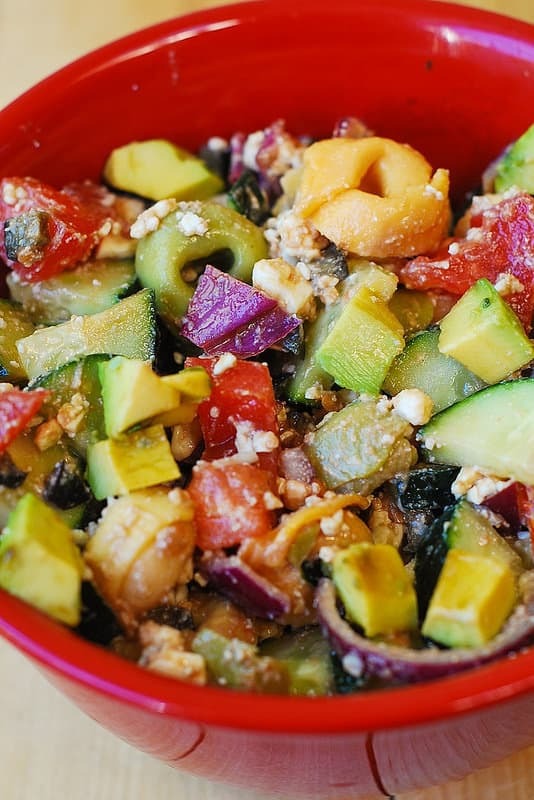 It’s a delicious and healthy salad that uses fresh ingredients, lots of vegetables, and the dressing is made completely from scratch! 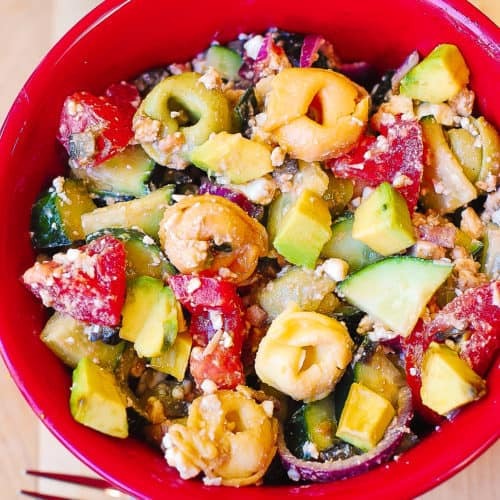 I’ve really been into Mediterranean food lately, and this Greek tortellini salad is a perfect example of delicious and healthy Mediterranean cuisine: lots of veggies, a little bit of pasta, feta cheese (low-fat), homemade dressing made with olive oil (healthy fats) and balsamic vinegar. In a medium bowl, combine together all salad dressing ingredients, except salt: 1/4 cup olive oil, 3 tablespoons of balsamic vinegar and 1/4 teaspoon ground black pepper. Whisk until emulsified. Add just enough salt to suit your tastes – should be about 1/4 teaspoon of salt. 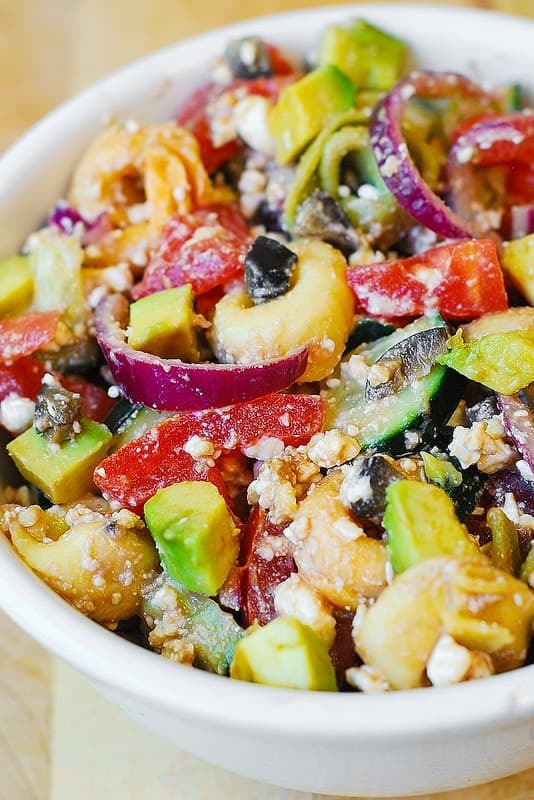 While this Greek tortellini salad is great served right after it’s made, it also gets better if you let it marinate overnight (or at least for 2 hours) in the refrigerator. If you let the salad sit in the fridge for at least 2 hours, the flavors will start to really soak into the pasta and other ingredients. I love crumbled Feta cheese combined with tortellini and Greek salad dressing – the cheese gets so creamy and so tasty! Pesto Chicken, Tortellini, and Veggies – healthy, easy-to-make Mediterranean-style dinner. Creamy Sausage Tortellini with Spinach, Tomatoes and Mozzarella cheese sauce – Italian style comfort food. Tortellini with Shrimp and Veggies – spicy shrimp smothered in a creamy Mozzarella cheese sauce with sun-dried tomatoes and spinach! SO GOOD! 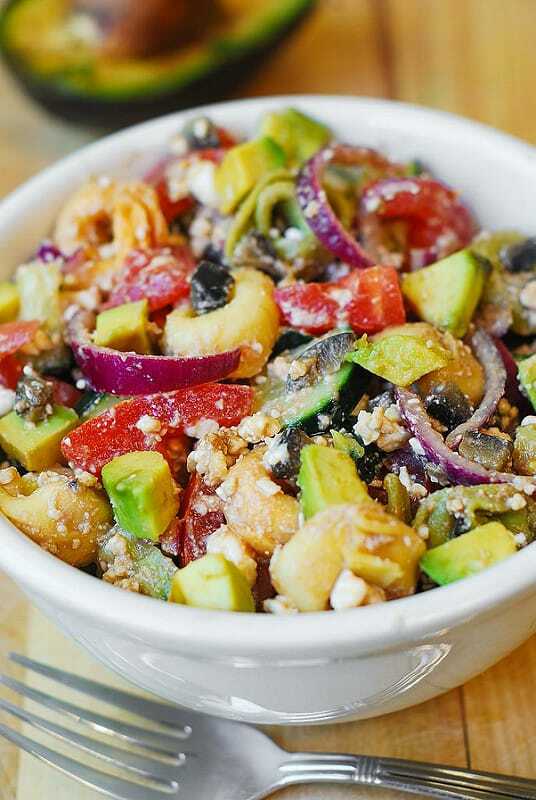 Greek tortellini salad with tomatoes, avocados, cucumbers, feta cheese - in homemade Greek salad dressing. Healthy Mediterranean recipe with lots of veggies, some pasta, feta cheese (low-fat), homemade dressing made with olive oil (healthy fats) and balsamic vinegar. In a medium bowl, whisk together all salad dressing ingredients, except salt. Add just enough salt to suit your tastes - should be about 1/4 teaspoon of salt. In a large bowl, combine all salad ingredients. Add just enough of the dressing to the salad to coat and toss. Don't add all the salad dressing at once - you will probably use only about half of the salad dressing. At this point, your salad is ready to serve. Or, you can cover and chill the salad for a couple of hours or refrigerate overnight. Also chill (or refrigerate) the remaining dressing. Before serving, let the salad (and the remaining dressing) sit at room temperature for some time because olive oil in the dressing would've have solidified in the refrigerator - let it liquify. Add more of the reserved dressing to the salad, if necessary. So fresh, colorful, and yummy! I don’t like raw onions and my husband doesn’t like black olives but it was still so great! Will make again! What can I sub. for the olives? Love everything else about this salad! Also, how many ozs. is the package of tortellini? Thanks!! Use capers instead of olives, or just omit them altogether. I think it was 10 oz package of tortellini. Made this tonight, did not have feta but I added two chopped grilled chicken breasts. Also used green onions instead of red and added fresh oregano because I had it. It was awesome! Thanks! 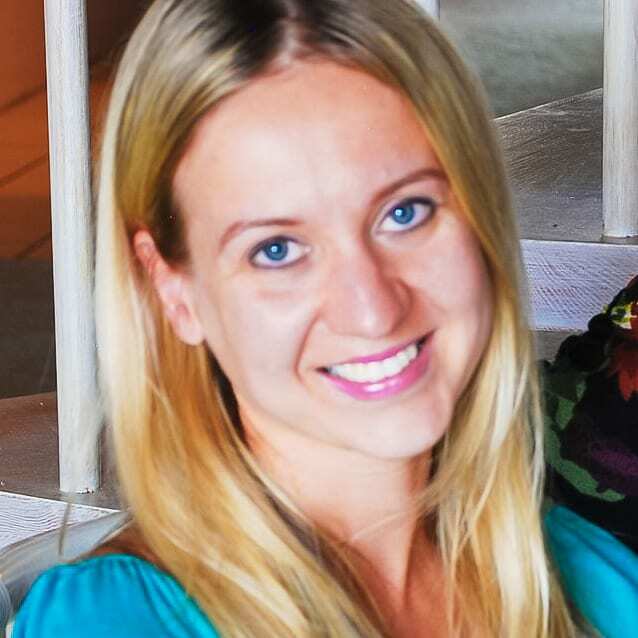 Thank you – I am glad you liked it! Grilled chicken sounds like a delicious addition!